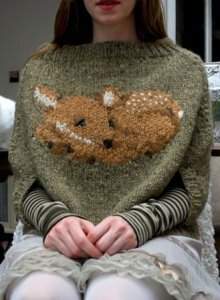 Top-down knitted poncho with an adorable fawn on the front. Finished Measurements: S/M = 22" wide at base measured flat and 20" long measured from collar to bottom edge; M/L - 24" wide at base measured flat and 22" long measured from collar to bottom edge. US 10.5-16"; US 10.5-24" or 29"
Berroco Booklet 401 Aero Patterns - Adda - PDF DOWNLOAD and Malabrigo Heritage Collection Patterns - Pintado - PDF DOWNLOAD are both similar patterns: adult pullover garment, for women, and bulky (12-15 sts/4 in) yarn gauge. You may enjoy taking a look at the , and Rowan Big Wool Woodland Hoodlet kits all using Tiny Owl Knits Patterns. Hopefully our suggested yarn options for Fawn Poncho can help you come up with your next exciting new project idea!